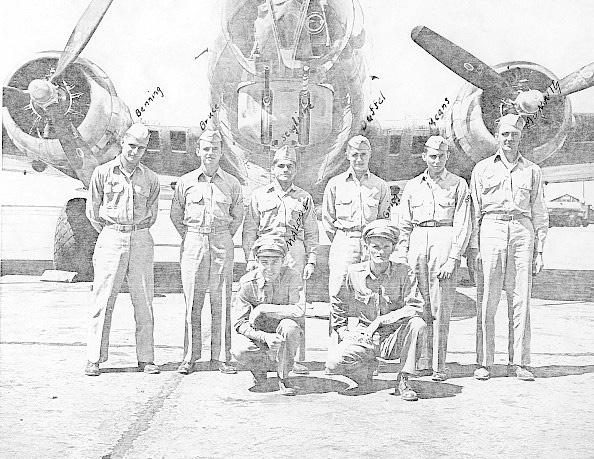 The Crew trained together at Pyote, Texas and arrived together at Molesworth in June 1944. 1Lt Merrill J. DuMont (CP). Flew most of his missions with the Griggs Crew. Upgraded from CoPilot to Pilot on 6 October 1944. Flew 6 mission as 1st Pilot in November 1944. Completed combat tour on 27 November 1944. Volunteered to Fly P-51 fighters with the 1st Scouting Force, 857th Fighter Squadron which was attached to the 364th Fighter Group at Bury St. Edmunds and later at Bassingbourne. Flew 21 missions in the P-51D Mustang. Recalled to active duty in 1951 and flew F-86 fighters. See his Scouting Force Story "Rocket Hunters". See Painting by Heinz Krebs "Rocket Hunters"
1Lt William A. Malone (N) - Flew all but five missions with the Griggs Crew. Completed combat tour on 4 November 1944. S/Sgt Henry W. Means (WG) - Flew all but two missions with the Griggs Crew. Completed combat tour on 4 December 1944. His brother 1Lt Wilford T. Means was a 427th BS Pilot, assigned to the 427th BS on 29 May 1944 and completed his 35 mission tour on 13 August 1944. The Brothers lived about one hundred yards apart during the months that they were both assigned to the 427th BS. Sgt Miles R. Bruce (TG)(KIA) - Was killed on 12 September 1944, mission #241 returning from Brux, Czechoslovakia in B-17G #42-97311 Shoo Shoo Baby, (427th BS) GN-O. A 7.9mm shell cut off his oxygen supply and inflicted fatal wounds. His body was returned to Molesworth and he is buried in the American National Cemetery near Cambridge, England. T/Sgt Joseph Scaglione (WG)(POW) - Was removed from the Griggs Crew prior to the start of their combat missions on 9 July 1944 when crew size was reduced from ten to nine men. He was utilized as a spare Radio Operator with other crews for his first 14 missions. On 16 November 1944 he was made the Radio Operator on the Lt Jack W. Rose Crew having flow two previous missions with this crew on 19 and 30 October 1944. Flew 18 missions with the Rose Crew. 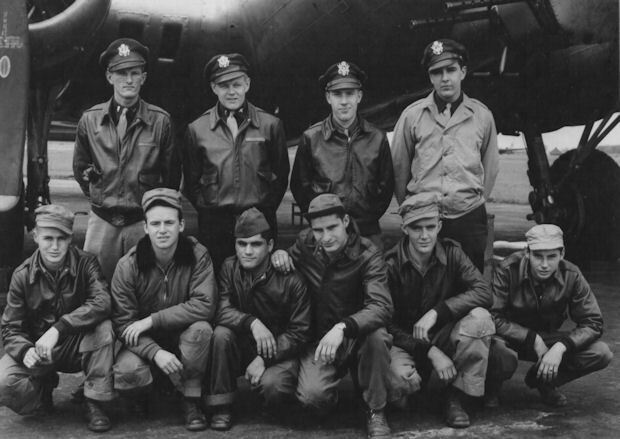 His crew was shot down on mission #301, 13 January 1945 to Mannheim, Germany in B-17G #44-6616 Red (427th BS) GN-V. The B-17 received a direct flak hit in the #3 and #4 engines which caught fire. The crew bailed out after loosing altitude at about 20,000 feet. The B-17 crashed at Primasens, Germany near the French border. The crew was captured that day except for T/Sgt Scaglione and one other crewman who hid in a woods that night and walked in a westerly direction evading capture for seven days. The Sergeants were placed in Stalag VII-A near Moosburg, Germany and were released on 29 April 1945 by the 14th Armored Division of General Patton's Third Army. See 427th BS Jack W. Rose Crew photo.